Post your upcoming trip out to Anza Borrego here. Great place to organize a group trip. My father introed me to Goat Canyon Trestle many years ago when I was a kids at the model railroad museum. Since then I've been there numerous times. But my father has not. Into his 70's and newly replaced knee, I'd like to give him a view of Goat Canyon trestle and was wondering if any one knew if you could see if anywhere form McCain area? He can't really hike much at all. Hoping for a drive up and walk a little ways and see it with Binoculars or something to the effect. I don't remember for certain. I want to say yes, but really hard to see because it is tucked into the canyon. You can definitely see the trestle from some of the benchmarks on the McCain side, but those are too much of a hike from the sounds of it. I am more certain, but not 100%, you can see the smaller trestles from McCain. I would try the Sacotone overlook first. Even if you can't see it form there, the view is great across to the tracks. There is also a steep 4wd road before the overlook that might give a better view. Another overlook before Cottonwood camp on the right as you drive out might have a view. I can't remember the name of the second overlook. I too remember seeing the trestle for the first time at the model railroad museum as a kid. Good times. I think it is cool you want to experience the view of the trestle with your Dad. My Dad's knees have been going for the last few years. It has gotten so bad that this year he declines my invites to the basketball games due to the stairs at Viejas Arena. My Dad turns 77 in a few months. He has started consultations for knee replacements. I once experienced the trestle via small plane. It was a special plane that made the experience even better (a Grumman that the canopy pulled back exposing the cockpit to the elements) but any plane would do. The view of the trestle could only be beat by hiking to the trestle; the view from the start of the bend is amazing. Good luck on experiencing this with your Dad. The trestle is hidden around the corner on the left. I am not thinking there is an easy access to a view of the trestle, you could possibly drive in to Redondo Flat but I can't remember if the trestle is visible, it is sorta tucked back in the corner. Zoom around in Google Earth, you may find a view point. 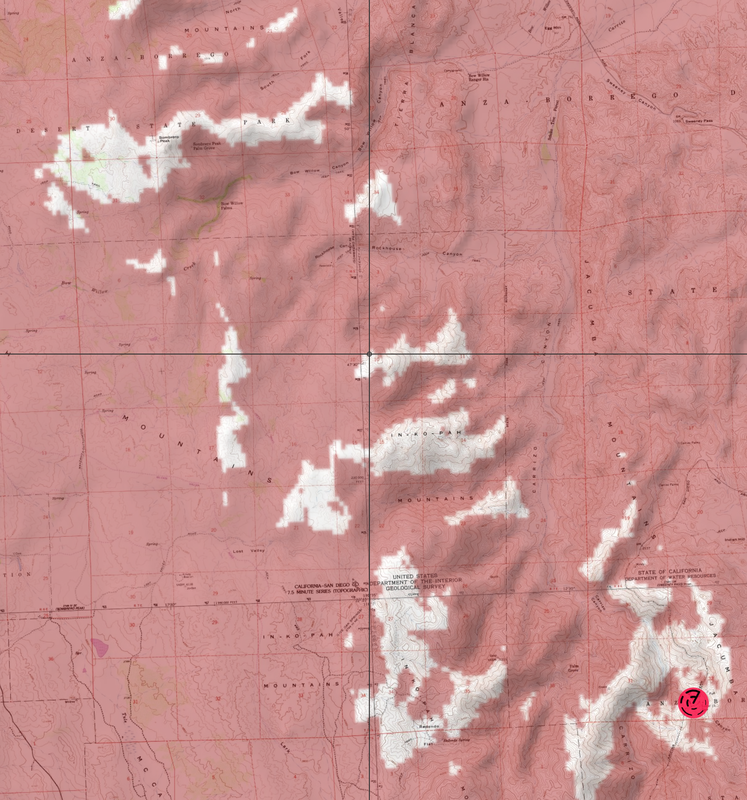 Possibly could head to Redondo Flat or that little patch of white just to the SE of the Carrizo Overlook. The trestle is just too low to be seen from most of McCain Valley. Is the area of Redondo flat drive able? I see trails but is it legal to drive to that area? Dad'd not going to wan tto walk to much but a bit is ok I would imagine. I was able to drive my '81 Toyota SR5 down the skinny "road" to get there....that was a couple years ago. Sure is green in that pic. I seem to remember that road was closed to cars and gated in the last couple years. I might be mistaken. I saw no signs and no gates but the "road" I followed in was more of a motorcycle track which my little truck navigated easily. I followed the road (seen in the photo) out and saw no closed gates either. Looks like the photo was from March 2015. Yeah, that road is very narrow. It looked like it was gated and signed for 2 wheel vehicles only a year or two ago. This was the road into Redondo Flat from the road going to Sacatone.